...and to all a good night! Don't you just love that poem? Are your stockings hung by the chimney with care? Are your children nestled all snug in their beds with visions of sugar plums dancing in their heads? Do you have your kerchief or cap on and are you ready for your long winter's nap? Well, we don't hang stockings. Instead we hang huge knitted mittens! I don't have a current picture of them, but you can see them HERE from a few years ago. 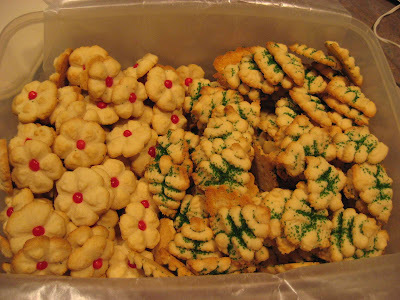 My very favorite spritz cookies. I make them in Christmas trees and flowers with a little cinnamon red hot in the middle. They are so delicious dunked in a hot cup of tea! And almond roca, a candy my mother always made but I never had much luck making myself until I found a new recipe for it on the Land O'Lakes website. Since then, every batch has come out perfect! 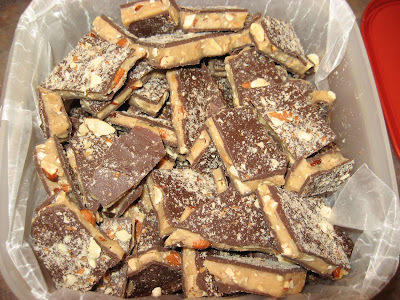 The only things I do differently from the recipe are that I use almonds instead of pecans or walnuts, and I use melted milk chocolate on both sides of the candy instead of semi-sweet on only one side. I also made some white chocolate macadamia nut biscotti which is also so scrumptious dunked in tea...I don't like to wrap up the end pieces for gifts, so I have to eat them myself! And of course, I included in some of the gifts a jar of jelly that I make every year. Yum! Our Christmas tree is all decorated with hundreds of ornaments from our 28 Christmases together, and this year we added a colorful paper chain at the request of our crafty little kindergarten student Grace! 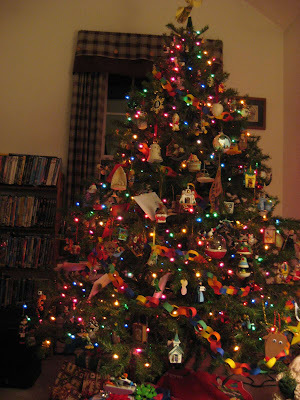 This picture was taken last week before most of the gift wrapping had been done, but right now you can hardly get within arm's length of the tree for all the gifts surrounding it. Our nativity set has its place of honor in our home and you can see that Baby Jesus has arrived. What a joyful occasion! Our children are nestled all snug in their beds and Santa has already come to our house. I think that means it is time to wish you all a very merry Christmas, and sign off for a day or two. Christmas blessings to you all! Wishing you a warm and cozy Christmas. Merry Christmas Mary Grace...beautiful tree and nativity...my 5 year old granddaughter calls it "activity"! I made the most DELICIOUS soft caramels this year...perfect recipe...off the Land O Lakes website...Aunt Emily's Soft Caramels...you'll have to give it a try! Enjoy your day with family! Secret Santa Christmas Swap gift received! eat. play. sleep. repeat. quilt finally finished!